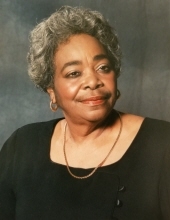 Mrs. Florence S. Stackhouse, 83, of Chase City, VA entered eternal rest on Saturday, January 26, 2019 in Newport News, VA.
Mrs. Stackhouse was born in Chase City, VA August 2, 1935 to the late Arthur and Belvia Elam. She attended Finneywood Elementary and the Historic Thyne Institute, graduating from West End High School. She accepted Christ at an early age, and was baptized at Finneywood Baptist Church, where she served on various ministries. Mrs. Stackhouse was formerly employed by Stanley Garment Company, and later with ASCS in Boydton, VA where she served as a Program Manager. In addition to her parents, Mrs. Stackhouse was preceded in death by her husband, Earl Stackhouse, and her brothers and sisters. Cherishing her memories are her twin sons, Donald E. Stackhouse (Angela) of Newport News, VA and Ronald L. Stackhouse (Sandy) of Danville, VA; two sisters, Mary Esther Elam and Carol Nesmith both of Philadelphia, PA, and a vast number of other loving relatives and caring friends. Funeral services for Mrs. Florence S. Stackhouse will be conducted 11:00 A.M. Saturday, February 2, 2019 at the chapel of Giles-Harris Funeral Home, Chase City, VA with Rev. Curtis Hurt delivering the eulogy. Burial will follow in Finneywood Baptist Church Cemetery, Chase City, VA.
To plant a tree in memory of Florence S. Stackhouse, please visit our Tribute Store. "Email Address" would like to share the life celebration of Florence S. Stackhouse. Click on the "link" to go to share a favorite memory or leave a condolence message for the family.